28th March: The Underground Farmers and Craft market at The Underground Restaurant. 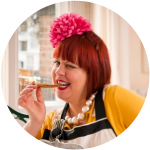 I welcome other supperclub hosts who’d like to sell their goods or give cooking demonstrations. I also would love people who make food, drink, or kitchenware, who grow things, who sew, who bake, pickle, ferment, to sell, demonstrate and explain what they are doing. I particularly would like to encourage Londoners who forage wild food, make honey or cheese or smoke fish, whittle or weave, who have vintage (shabby chic style) kitchenalia to come and sell. Looking for a piano tuner, some gardening help, volunteers for prepping and front of house, pro chefs/cooks who want to cook a course, and recipe testers, who have normal ovens, for my forthcoming book. Previous Post: « 2kTen innit? What a busy year ahead you're going to have. I love the idea of the Farmers/Craft market,giving people a chance to promote themselves. Good Luck with it all. Agree that the Etsy / Borough mash-up sounds interesting. Forth-coming book, eh? Sounds very exciting. I have a normal oven so would be happy to test recipes if you like. Sounds like a great idea. I'm not sure if my cupcakes are good enough to sell (check them out on my blog) but I'd love to be involved. I also have a fairly horrid fan oven and would be happy to be a veggie recipe tester for you. The evenings sound fab. Trying to persuade my sister that a night out as 18th century pirates is just what we both need. I have a normal oven and I test a lot of recipes for work, so could help you with your book? Sounds like 2010 is going to be an exciting year for you. For midnight feasts, didn't they always have "sardines pressed into gingerbread" at Malory Towers? I've always wanted to try it but never dared!! Midnight feast food: yes should probably have a read of those classic boarding school books…but pressed sardines into gingerbread sounds weird doesn't it? I'd love to test recipes if you still need people. I've tested a few for Sainsbury's magazine before and used to work in a cookery school. I've recently been made redundant from my 'proper job' so have time to devote to my passions – food and writing! I'll join in on the recipe testing if you still need people – slightly too hot fan oven and a ceramic hob. If I was in London I'd be totally up for bringing some baked goods to the farmer's market, and the breakfast sounds delicious! Hopefully will be down south sometime soon – can't wait to come back. I would love to be a recipe tester! I have not yet been to the underground restaurant but live near by and will definitely be coming for an evening soon. How do I get involved with recipe testing for this event?